Weekend again - time for an avalanche of video games. I finally found the secret to getting Sacher Torte to take her medicine... CREAM CHEESE!! @The Hole Got Fixed, get better soon! ...Wait , college? I thought you were only fifteen?! Now, in my life: I'm going to see Greta Van Fleet in September. My birthday is August 30th, so I'll be sixteen when I go in September. 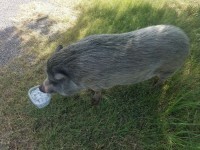 I saw this pig roaming around our neighborhood yesterday. I saw it again this morning. Then I saw it again this afternoon. I began to wonder if it was a pig someone had dropped off in our neighborhood. I decided to see if it needed some food and water. It ate dog food and drank the cold water I gave it. It even ate the ice cubes in the water. A man drove by and said that the pig belongs to one of my neighbors, but that it kept getting out. Another neighbor says he is going to take it if it keeps getting out. ...But, don't you normally go to college when you're an adult? Or is the UK's education system that much different to Canada's? And good luck with that piggy, AG. I hope everything turns out ok for the little guy. I think they use the word uni to mean what we mean for college or university. Someone correct me if I have that wrong. In the UK, you have to stay in education until 18, and then in employment until 68, so yeh, it's the education system. Yeah, that was the assumption I was under. Ooooooh. Okay. Yeah, no, I think the differences in what we call things is part of what's messing me up. I just missed them when I went to see Muse at the Carolina Rebellion music festival in May. I did hear Robert Plant Josh Kiszka* howling from the parking lot/carpark, though. *He really did sound like Robert from a mile away. Andrew Ridgeley on 'Good Morning Britain', he was in Wham and was there to promote and discuss a celebrity big ride he had done for charity raising £1m+. Incredible to hear him be asked questions about Wham and not want to discuss them, instead only wanting to talk about the charity, the reason why he agreed to turn up. Very much like George was in that the past isn't that interesting to him and would rather focus on other things, which Andrew himself admitted in the interview. Very refreshing to see and will be interesting to see the public reaction. Made a new ringtone for my phone, it’s a part from The End instrumental. Currently on annual leave for almost a week and am on a two night getaway from home. Football on the tv and will go and pick a few odds and ends to survive on over the next couple of days. One suggestion was go and walk around the lands. More likely I'll spend time between swimming and watching the football. I'm knackered after too many hours at work. Update on the pig. One of the neighbors walked it home the other night, and the woman at the house said she wished somebody would just take the pig or it would get lost. I went to see the pig the last two nights. It was in its fence with no food or water. I took it some of both. Tonight, Neighbor N and some other neighbors were outside with the pig. They were trying to figure out how to get it down to Neighbor N's farm. I ended up walking a pig half a mile to its new home. I just kept calling to it and feeding it pieces of food to keep it following me. I know it is in good hands now. Friday afternoon here. Planning to see Jurassic World: Fallen Kingdom tomorrow. Not expecting anything great, but it's something to do. Great about the pig and good on you Ahhh Girl for being so kind. Hate neglect to animals (and humans) so it's nice the pig is in a happy home after being ill-treated. I head home today after two days relaxing. Tomorrow I'll get the vinyl records my sister bought me for Christmas; Swedish editions of 'Revolver ', and the 'Help '/'I'm Down ' single, plus an EP consisting of tracks from 'Rubber Soul ' that I asked she pick me up - entirely different to the UK and US releases. Think this is the first Beatles vinyl I've had since the 2014 box was released. Don't ask me if they are originals, I don't care. Beatles is enough for me. I just spent 2.5 hours writing one email to one of our vendors to tell them all the bugs I have found in THEIR system. They wanted screen shots. Why do we pay them so much $$$$$ when I, the customer, have to tell them to get their data cleaned up? * Yes, I'm a bit steamed at the moment. * I think I should be allowed to take the rest of the day off. *Getting to use BB forum smileys just helped me calm down some. I hope you get back on your feet soon, materially and mentally.